Home > Dollars & Sense, Social Issues, The Body Politic	> Shafting our own children’s future? Hell yeah, why not! Experts say there is no sign of the market slowing soon, and one commentator forecasts the average price in Auckland could hit $1 million within three to four years. Aside from being a total failure of the so-called “free” market, what else is causing prices to skyrocket? National says that local bodies are holding up consents. Some blame it on immigration and/or overseas investors buying up houses and pushing up prices. Others blame it on investors and speculators exploiting the lack of a Capital Gains Tax to buy up properties, which reduces availability, and pushes up prices. Others blame central government for not investing enough in tradespeople, to build new houses. This blogger will add one more component into the ‘mix’; easy availability of capital. Prior to 1984, housing prices were contained by limited, local availability of funds which banks could on-lend to house buyers. New Zealanders’ savings were poor pre-1984, and Muldoon’s scrapping of Labour’s compulsory super fund in 1975 did not help matters. As the graph below shows, housing prices up till 1972 were steady. People usually had 10% deposit; borrowed perhaps 60% to 70% as a first mortage from a friendly bank manager; and the balance was financed by what was known then as “Vendor’s Finance” – the seller agreed to 20% to 30% as a Second Mortgage for the buyer. The latter incurred much higher interest rates. Overall house prices were therefore ‘capped’ by the limited availability of money, from banks and vendors. Banks acquired their funding from local depositors. In 1972 and 1980, two international oil shocks resulted in massive inflaton inflation in the country, sending house prices surging. Post 1984, Roger Douglas de-regulated the country’s financial laws and banks were able to borrow vast amounts from overseas lenders. There was no longer a shortage of funds for mortgages. The concept of “Vendor’s Finance” and second mortgages disappeared almost over-night. Purchasers could now borrow 80%, 90%, even 100% to buy a house. As money became easily available, peoples’ expectations for bigger and bigger returns also rose. If Buyer X could borrow $200,000 to buy a house that Vendor Y had purchased last year for only $150,000, then there was nothing stopping the vendor from demanding the top dollar; $200,000. Maybe more, if Buyer Z could afford to service a $300,000 price. The sky was literally the limit. And as the graph shows, that is where house prices were going; skyward. This has created big problems for us. Firstly, housing prices are no longer affordable for young New Zealanders. As more and more properties are locked up by their parents’ generation (often referred to as “Baby Boomers”), the availability of new and existing houses becomes less and less. 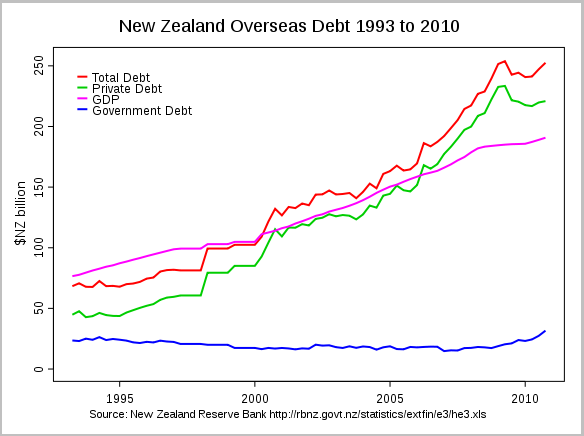 Secondly, as we borrow more and more money from overseas to invest in ever-increasing priced housing – our private debt is now approaching Greece-like proportions. Anything wrong with that picture?! For the past fourty years, this country has borrowed vast sums – billions – to finance our property speculation. Every time a vendor made a tax-free profit, it was financed by borrowing money from other countries. We were – and still are borrowing our way to “wealth”. It is neither sustainable nor common sense. And very soon, the bubble will burst; politicians will blame but themselves; and the public -as usual – will be left wondering what the hell went wrong. Labour has proposed a Capital Gains Tax on housing (except for the family home) as part of the solution. National – in a display of unmitigated stupidity – opposes any such tax. 1. House buyer’s will simply return to the days of second mortgages from lenders other than banks (usually through lawyers or secondary finance companies). The second mortgage will have a highrer interest rate. Home buyers will simply end up paying more in outgoings to service not one, but two, mortages. 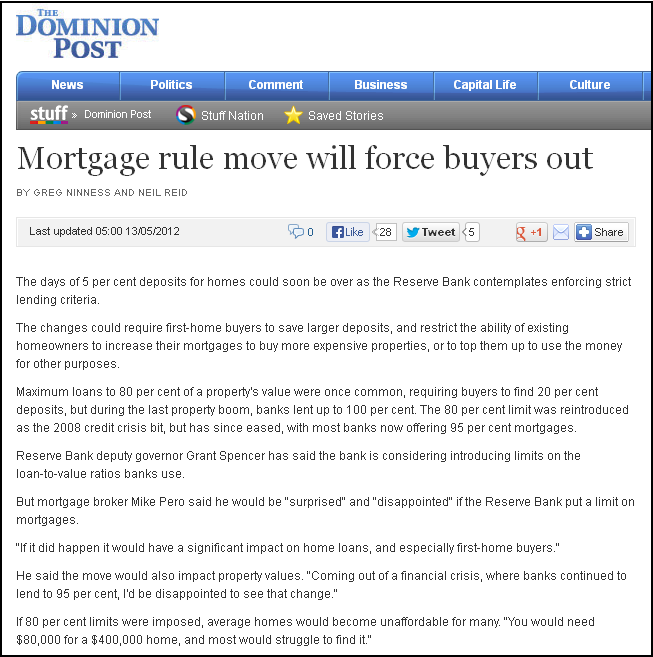 This will not help first home buyers. 2. Unless they are part of the privileged few – the One Percenters – first home buyers will find it next to impossible to pay rent and save for a deposit on a house. Factor in other financial burdens such as student loan repayments, and life just got immeasureably harder for young New Zealanders. The upshot of the Reserve Banks “solution” is that it does not address the problem of rising house prices. It merely penalises young New zealanders. Meanwhile, the Baby Boomer generation buys and sells properties, tax free, pocketing big gains, financed by offshore borrowings. This is madness, and make no mistake – we will end up paying for this insanity in a big way. Maybe it is time to socialise the land and introduce a Land Value Tax – LVT – the private component is what you do with the land – house, business, farm etc which is yours to improve, sell, own outright and not taxed. Watch the unused land come quickly on the market as developers and land owners holding onto land waiting for capital gains, tired of paying for land which is not earning them anything until they develop and/or sell. There would have to be a pay-off like getting rid of GST and gradually lowering the tax on wages. Just a thought. … sounds like a plan.